Reinforcing steel, also known as rebar, is steel that is hot rolled and used in the construction industry for concrete reinforcement. Its use dates back to the 15th century in Paris where the Château de Vincennes was built. It is one of the first known castles to have used rebar. Today, rebar is widely used for a variety of reinforcement construction needs. 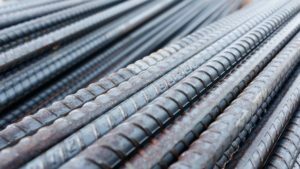 How is Rebar Primarily Used? Rebar is made of durable, unfinished steel that is ideal for all types of construction projects given that it is straightforward and easy to use. The most common use for rebar in construction is to prevent concrete from cracking over time. While providing strength to the concrete, the affordable material also guarantees that the building will last longer. We offer a variety of sizes and grades. Our standard sizes are 20 ft, 40 ft, 60 ft, as well as shorter remnant sizes. Please email us regarding your specific project. We can help meet your requirements. *The U.S. size chart is different than those of other countries who don’t use the # sign but instead use an M for millimeters. Contact Steel Specialties, Inc. Today. Get in touch with us today regarding your construction project that requires rebar. We service El Paso and surrounding areas such as Las Cruces, Deming, Santa Fe, and Albuquerque, NM. For more information and estimates, you can reach us at sales@steelspecialtiesinc.net or by giving us a call at 915-590-2337.